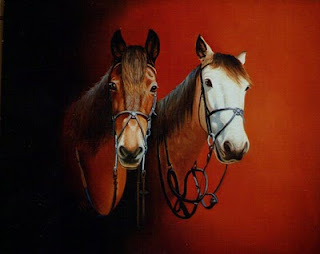 Oil Painting Medic: What is the Secret to Horse Painting with Realism? An artist’s first encounter with equestrian art may produce a stuffed-looking horse, with hair and mane that looks too perfect or stiff and eyes that stare lifelessly. In other cases, the artist may fail to get to grips with the horse’s elongated features, allowing an empty space to stretch between the horse’s eyes and snout. How does the artist paint horses convincingly? Making idealised assumptions about how a horse “should” look like and subconsciously allowing this dictatorial part of the brain to interfere with the creative process. For instance, a horse has four legs (from certain angles, only three may be visible); a horse’s mane resembles a fringe that festoons the length of the horse’s neck and emerges between the ears; all horses have long teeth; the horse’s snout is always black and has two nostrils of equal size (again, both may not be in view, and may appear to have different shapes), and all brown horses are chestnut in colour, etc. Using poor photographic reference, forcing the artist to guess-work areas of the horse’s portrait or body, and allowing the aforementioned dictatorial part of the brain to fill the gaps. Using only white to illustrate horses’ eyeballs around the irises and the teeth. Illustrating the horse’s hair by linear strokes via a thin brush and using the same brush marks to cover the horse. Using premixed pigments such as a particular brown, black, beige or white for the horse painting and using the same colour to illustrate various elements of the horse. Leaving areas around the horse’s features blank, such as between the horse’s eyes and snout and the between the eyes and ears, resulting in a two-dimensional impression of a horse. Not every contour appears as a line. Sensitive observation will reveal that some contours consist of abstract and subtle shifts in colour and tone. It is wise to half close the eyes in order to simplify these shifts into basic areas and to work from the simple to the complex. Stand back periodically to gain an overall impression of the horse painting. Look out for reflected light on the horse’s face. Reflected light is when a shaded area is illuminated by reflections from a shiny surface, such as a wall or mirror. Reflected light might be most apparent around the horse’s snout or ear. Horse’s eyes, snout, hair and ears should not be denoted by mere outline. Close observation, will reveal that eyes and ears have rims and tucks; hair has localised shadows and the nostrils are surrounded by undulating flesh. The horse palette may possess the most unlikely colours, including blue, violet or crimson. Highlights often contain ultramarine, horse hair may contain maroons, and shadows over the horse’s teeth may require a little earth colour or blue. M any oil painting techniques are suitable for equine art, from impasto to alla prima, but to achieve realism in a horse painting, I will paint onto a toned ground, or imprimatura. This entails using a neutral-coloured ground rather than a white painting surface. I find this helps me judge tones more accurately. A thin wash of acrylic paint (usually blue or brown) should be applied over the canvas or primed art board. It is vital to sketch the horse precisely, or the painting will be ruined. Paint from the large areas and work down to the detail. Soft sable brushes are vital for blending and applying glazes. Fine brushes of sizes 3 or 6 are good for detail, such as the horse’s eyelashes, hair and highlights. Wide soft brushes of size 9 upwards are ideal for blending areas around the mane and nose. Linseed oil can be added to thin the paint to apply detail or soft glazes. I will often work from dark to light, which means rendering the dark colours on the horse first, and then finishing off with the highlights, which can be found on a shiny horse’s coat, eyes, ears and moisture around the snout. Numerous earth colours are not necessary for horse painting, and may even cause dirty or dull colours. The oil pigments I use most are: burnt sienna, burnt umber, French ultramarine, pthalo blue, permanent rose, cadmium red and white, but do look out for other colours. Great tips and thanks for sharing such informative information with us and I am waiting your another post.